Apples that won’t turn brown when sliced are about to hit the market. First, we should understand what happens to a standard apple when you slab it and leave it. When you slice an apple, you let oxygen reach the plant tissue. Once oxygen impacts the cells, it starts some chemical reactions that oxidize the apple. This process is known as enzymatic browning and also occurs in other fruits and vegetables like bananas & potatoes. You can find a more detailed explanation here. The idea is to produce apples that won’t become brown. For your understanding let’s go through why these apples won’t turn brown. 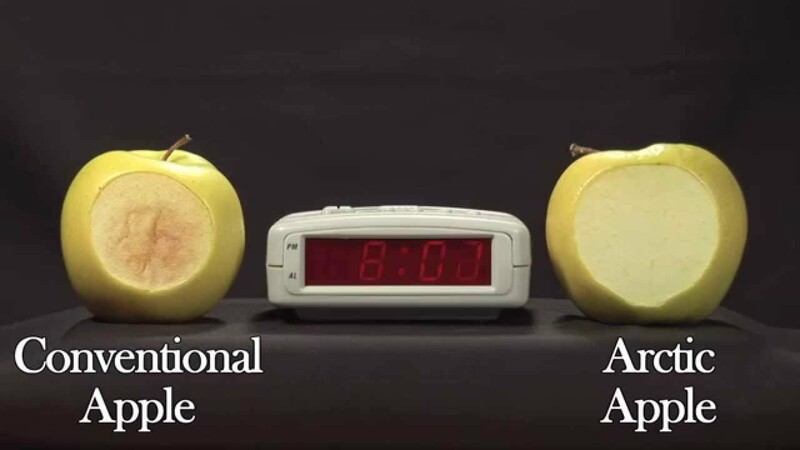 Why doesn’t a GMO apple turn brown? Through genetic modification, engineers insert extra copies of genes that the apple already has. When these extra genes are added, the apple reacts by locking all of its normally functioning activities, and stops itself from producing the enzyme that causes the browning reaction. It sounds easy and clean, but this kind of manipulation (RNA Interference) causes a lot of unexpected and unintended side effects. As we just mentioned, in order to modify an apple, we manipulate what is known as the RNA interference. RNA interference limits transcript levels in the apple by either suppressing transcription or by beginning a sequence-specific RNA degeneration method. For a full understanding, you should check this out. However, these methods of manipulation are those that have the unintended side effects for the plant and also on the organisms that eat it. Why? Well logically speaking, browning is an essential sign to consumers in deciding how fresh a plant is. If we suppress and hide the signs of nature we use to identify the state of a plant, consumers (whether in the wild or at your local store) will fall into the trap of eating something that looks fresh and edible, but is in fact not even close. One of the best-known side-effects of GMO crops is the “herbicide tolerance” they often develop. The genetically modified crop, whichever kind it is, learns to resist normal levels of pesticide the farmers usually spray. In reaction to the crops’ new resistance, farmers increase the levels of pesticide they normally use in order to counter the problem. What we end up with is not only environmental contamination, but also a HUGE amount of toxic residue on our fresh produce. This all ends up inside of us and in other organisms. Additionally, you should know that food allergies have skyrocketed since 1996, curiously just after GMOs were introduced. Click the link to read more about GMO risks. We don’t entirely understand how genes work. How could we guarantee that RNA interference has no life threatening side effects? Every scientist knows that any gene can generate more than one protein, and that injecting a gene anywhere in a plant can produce rogue proteins. It’s been twenty years since genetically engineered crops have appeared in your local store, however studies on how they impact human beings are only just now beginning! Finally, we are in severe risk of making major biological pollution. How can we avoid massive contamination? Please take a few minutes to imagine this scenario: Somewhere, a crop exists with these kinds of modified fruits or veggies. Birds who eat the plants in one field, fly and release its seeds in the field of a different area, eventually spreading this half-baked recipe for disaster. When the soil used to raise GMO crops become contaminated, that is another risk we take in poisoning our own water. It is impossible to isolate the poison exclusively to the fields we grow GMO crops in, and also claim that we can avoid the risk of contaminating our water, animals, insects, and human beings in the process. If you enjoyed this article and want to do something about GMO crops, then click here to take some action!